Betsy Knapp (1943-2017) was a much-loved member of the Wellesley College community whose friendship and decades of support had a profound effect on generations of students. Her energy for creativity and innovation was contagious, and it is that spirit that drives not only the work we are doing in "Knapp" as it's called, but across our LTS Teaching, Learning and Research Support. Betsy's focus on risk, experimentation, and enabling people to do things they didn't know they could do was always apparent. The generosity of Betsy and her husband Bud made possible the creation of the Knapp Media and Technology Center in Clapp Library 1997 and the Knapp Social Science Center in Pendleton Hall in 2001. She served on the Wellesley College Board of Trustees for 15 years, was a founding member of the Wellesley College Business Leadership Council, and co-chaired the College’s record-setting $400 million comprehensive campaign that ended in 2005. Perhaps most of all, however, Betsy will be remembered for inspiring admiration and affection in everyone she knew. A pioneer in online interactive computer software, an angel investor, and a passionate philanthropist, Betsy exemplified Wellesley's motto, "Not to be ministered unto, but to minister." This site focuses almost exclusively on gifts to Wellesley College from Betsy and Bud toward instructional technology, one of many areas where they greatly helped the College. The Knapp Media and Technology Center and the Knapp Internships and Projects are the key subjects of this site. Her energy for creativity and innovation was contagious, and it is that spirit that drives not only the work we are doing in "Knapp" as it's called, but across our LTS Teaching, Learning and Research Support. Betsy Wood was born in 1943 and grew up in Evanston, IL. While at Wellesley, she majored in Economics. Her activities as an undergraduate included singing in the choir, serving as chair of the Sophomore Social, participating in the Junior Show, and serving as House President of her residence hall (McAfee). 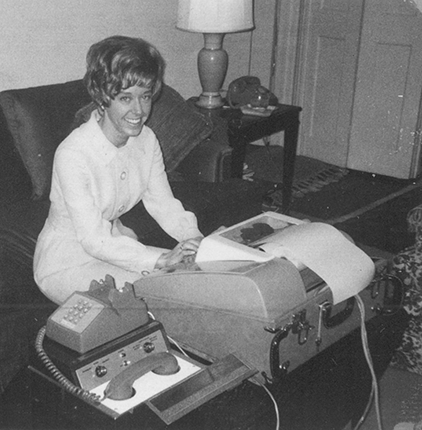 After graduation, Betsy worked from 1966 to 1967 at the Sloan School of Management at MIT for the Marketing and Operations Research departments. There Betsy took courses in Fortran, the early programming language, and learned about systems design. Equally as important, Betsy discovered her ability and passion for using computers to solve complex business problems. 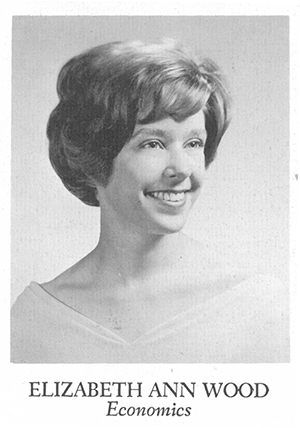 After working briefly as the Systems Coordinator in the computer department of Young and Rubicam, Betsy was invited by a colleague to become a VP in a new company (Telmar Communications Corporation) providing online access (via early terminals) to marketing and media databases such as Nielsen, Arbitron, etc. Betsy was initially responsible for marketing and client training, but her responsibilities grew to include product design and development, programming, and systems design. In 1978, Betsy moved from New York City to Los Angeles to marry Cleon T. (Bud) Knapp, the founder and CEO of Knapp Communications Corporation, which published widely admired magazines including Architectural Digest and Bon Appetit. 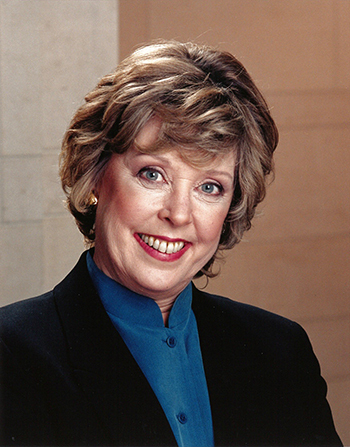 In 1986, she founded Wood Knapp Video, producing special-interest home video programs. In 1995, she founded BigPicture Investors to invest in early-stage tech and biofuel companies. In the spring of 1969, Betsy Knapp wrote this letter for the Class Notes section of Wellesley Alumnae Magazine. "In April of 1968, the manager of the data processing department at Young & Rubicam decided to form a company, Telmar Communications Corporation, and invited me to become a stockholder and vice president of the new venture...Telmar Communications is in the business of providing proprietary computer systems to the advertising industry via remote terminals. The systems operate from a network of time-shared computers which may be accessed by our clients from any phone in the United States. In many cases our clients have never had any direct exposure to computers, but the Telmar systems operate in English and all the user need know how to do is type -- even if only hunt and peck. Because I need to have a computer available to me at just about any hour of the day or night I have a terminal in my office and I also have one at home so that I can get work done there at night and on weekends. However, we have not yet reached the stage where I can order groceries via computer from my home - - but the day is coming!"